Walk through the F Street underpass in this working class neighborhood and you’re instantly drawn into true Las Vegas history. 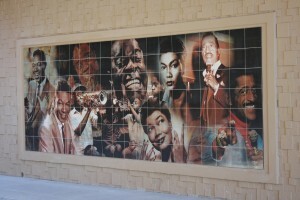 The faces of Sammy Davis Jr., Nat King Cole, Martin Luther King Jr. and many other well-known icons beam down from 12 beautiful ceramic tile murals — reminding us that Las Vegas’ success lies in its people, culture, and history. Up until 2014, the closed F Street underpass was a dangerous, run-down, and neglected part of the Westside District. Prior to its closing as part of the I-15 highway reconstruction, the underpass was local residents’ main access to downtown jobs and services. Eventually the community, local government, and private sector came together to plan, design, and execute the project. F-Street involved the installation of glazed ceramic tiles manufactured in China by Dal Tile. Computer-generated collages of photographs and hand-painted images were applied to the tiles that made up 12 murals. In addition, twenty-two glass mosaic columns, similar to those Superior constructed for the Wynn Hotel downtown, add drama and elegance to the sidewalk landscape as you exit or enter the F-Street Underpass. This entry was posted in Innovation and tagged ceramic tiles, Dal Tile, Downtown Las Vegas, F Street Underpass, Glass Columns, Las Vegas, Martin Luther King Jr, Murals, Nat King Cole, Sammy Davis Jr., Westside District Vegas, Wynn Hotel Vegas. Bookmark the permalink.